Achieve Australia is a not-for-profit community organisation leading the way in a new era of personal choice for Australians with a disability. With the recent introduction of the National Disability Insurance Scheme (NDIS), Achieve Australia and the people it supports are experiencing one of the most important social services reforms since the launch of Medicare in 1975. Despite this revolution in the disability services sector, the people who work and volunteer with Achieve Australia are as committed as ever to assisting people not to accept what is, but explore what could be. 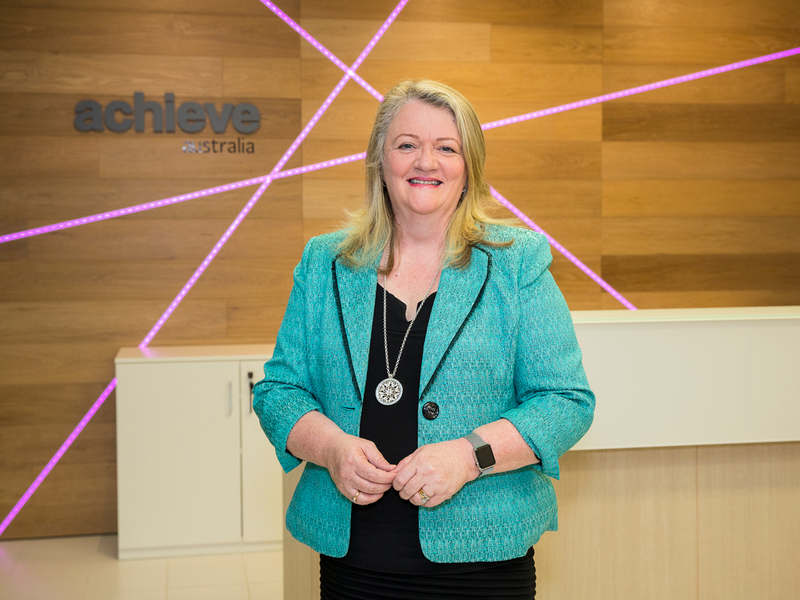 With 30 years of experience working in the human services and health sector before joining Achieve Australia in 1997, CEO Anne Bryce has been instrumental in growing the not-for-profit community organisation into the AU$33 million company it is today. Along the way, she has maintained a focus on guiding staff and stakeholders through the rollout of the NDIS. Anne’s passion and strong leadership has defined Achieve Australia as leader in the disability sector, supporting people with a disability to live extraordinary lives and make a valuable contribution to their communities. “Now that the NDIS rollout has begun across many areas of New South Wales, Achieve Australia is well positioned in terms of leadership, processes and technology to meet this challenge. We have a strong strategic plan in place — presented on a single sheet of paper — in order to drive it down through all levels of the organisation,” says Anne. With this strategic plan and a reinvigoration of company culture, Achieve Australia is leading a sector-wide adoption of person-centred approaches in the area of disability support. It emphasises valuing people with disability as individuals with dignity and respect, listening to one another and working in partnership to design and deliver services. Achieve Australia has been enriching the lives of Australians with a disability since 1952, through practical programs for learning work and life skills, providing advocacy and developing support facilities and services. Achieve Australia offers a range of tailored services that support people with a disability to live independently. It also provides services assisting people to source, train for and travel to suitable employment and services geared towards ensuring people with a disability are participating in community life and enjoying good health and wellbeing. We will be seeking new partnerships, new methods of funding and improved management of community housing assets in response to this unmet need. These services benefit from the goodwill, talent, donation and support of individuals and businesses lending their support, however, there are always major challenges for Anne and her team. The people who work for Achieve Australia are key to the success of the organisation and the support it can provide. Anne says their success is reliant upon what she describes as a strong and intentional culture. “A strong culture underpins everything we do. It’s all about the people we support and our goals. I make clear to everyone that these goals are the means to an end: to enable the people we support to lead fulfilling, meaningful lives and achieve social inclusion.